As the Pep era comes to a close and the Tuchel era dawns, it looks like business as usual in the Bundesliga. Bayern are 8 points ahead of Dortmund while BVB have a a comfortable 6 point edge on Hertha in 3rd. Bayern have pretty much wrapped up the title barring a shock but Dortmund’s improvements have seen them establish themselves as a legit rival if Bayern drop from their otherwordly level just a bit. Title races in the future have the potential to be something special, but let’s not get ahead of ourselves. Today we look at the teams as they have performed so far this season and some questions for the second half of the year. In Pep Guardiola’s final year, Bayern have pushed their game up another level. Their shot levels have never been higher and their shots allowed have shrunk below 7 per game, a level that seems unlikely to be reached anywhere anytime soon. Opponents barely get a sniff of goal, they are under 7 deep completions per game. For a few weeks before the injury problems hit, it was a pleasure to just enjoy a team who seemed to have almost solved the game. A Bayern game is essentially played completely in the opposition half, the stat that drove this home the most to me: Bayern complete more passes within a 25-yard radius of opponents goal than their opponents attempt. All this huge forward pressure allows Bayern to have a myriad of attacking options, it’s not surprising when you see 4 or 5 players in the box as they close in on goal. This year they are approaching shots a little differently. Bayern have the ball in the opposition half significantly more this season and spend a lot less time attacking on the wings. The center of the team has been pushed up and is more prominent. We can see the forward push in gif form here. One of the big reasons the ball is on the wings less this year than last is the change in personnel. Franck Ribery came back for one game, scored, then immediately was ruled out again with injury. Last year Ribery racked up a huge 78 passes per 90 out wide, and while Douglas Costa has played extremely well as a replacement, he’s not that type of player. His passes are generally further forward and come way less often: he makes 46 passes per 90, 30 fewer than Ribery. I wonder if Pep prefers it this way: an aggressive creative player who can make fewer touches count on the wing instead of running the game through it. It’s something we might found out in the second half. Another reason for this push (or possibly an output of it) is Xabi Alonso has pushed up significantly. His average pass begins several yards into the opposition half this season after starting in Bayern’s own half last year. The other big positional change comes from Alaba, which is unsurprising as he has yet to start in midfield. One of the benefits of the interior forward push has been the improved passing game deep down the field, led by improvements from Müller and Lewandowski. The two forwards haven’t changed their positioning much and are playing similar passes as far as attacking aggression compared to last season but both have seen a significant 4% bump in their completion percentages, presumably because there are more passing options closer to them. This has helped Bayern increase the danger of their deep possessions: last year they attempted more deep passes, while completing a good, not great, 41%. This year the number of passes has dropped but their success rate leads the Bundesliga at 44%. The rising percentage has come at least partially from attempting even shorter passes (under 24 yards on average when league average is around 28). 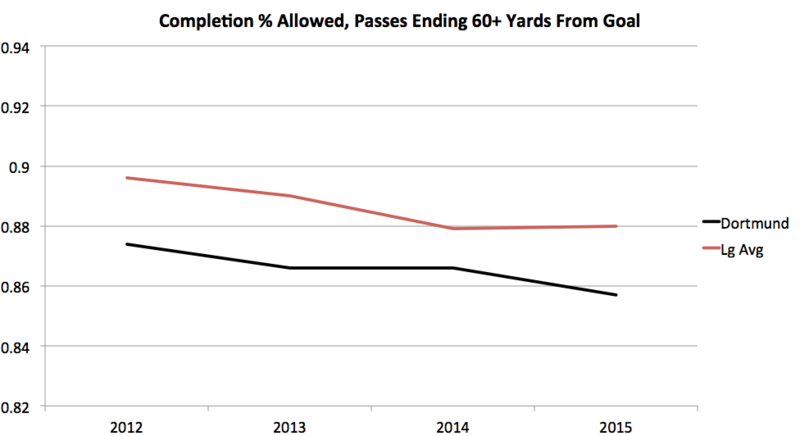 Shorter, more successful passes in dangerous areas is the story this year. Of course, when it comes to Lewandowski it’s not the passing that catches the eye but the insane shot volumes from quality positions. Last year he took 3.8 total shots per 90, this year he’s taking 4.8 from inside the box alone. Unsurprisingly, that rate leads Europe (only Ronaldo is close) and is almost a shot more than Bayern opponents take in total. This leads to the obvious question: how good would Bayern be if they were allowed only 2 non-Lewandowski shots per game? Making the leap to the assumption that Lewandowski would keep his shot rate around 6 per game despite opponents knowing they could focus on him, we figure 8 total shots for Bayern. Assuming a drop in the Lewandowski conversion rate to .15 and a non-Lewandowski conversion rate of 0.4 (the NL’s would only take great shots), we figure they will score 1.7 goals per game while allowing 0.5. Using Martin Eastwood’s pythagorean expectation we come up with Bayern around 73 points with this method. With great rigor, we can conclude that Bayern would still be reasonably strong favorites to win the league and would finish 2nd at worst with a hard cap of 2 non-Lewandowski shots per game. I think you would have to cut it to 20 total non-Lewandowski shots over the whole season to threaten Champions League. Defensively, sometimes the hype around Schmidt’s Leverkusen overshadows the steady heat Bayern put on you. Bayern and Leverkusen are way ahead of the pack in pressure, both holding opponents under 70% passing. The Bayern defensive line is so high they can help in the attack, as seen by Javi Martinez’s close range header from open play against Schalke and Jerome Boateng’s passing. More importantly the high line means they cut off your escape opportunities very quickly while Neuer’s range limits the amount of space to run behind. No team wins the ball back higher up the pitch and as we saw earlier, they are historically stingy with the number of dangerous passes they allow. And these passes are not just rare, but come from long range. As short as Bayern passes are in the attacking area, their opponents are forced into even longer passes when attacking. Up until the final match-day, I held out some hope we might see the lead at 5, or even 3 points, heading into the break. I would then be able to brandish this graph and proclaim Bayern are at risk if they can’t get their wingers back and we might have a title race between two roughly equally matched teams. Instead, the lead is 8 after Dortmund no-showed at Koln and the race is likely over. Will they be healthy? And if everyone is healthy how will Mario Götze be used? Someone on Bayern seems likely to become the best player in the world who doesn’t regularly start and Götze seems like a candidate to fill that role. Who will Pep go for if both Ribery and Costa are healthy? The brilliance we’ve seen from Costa (voted player of the year in at least one poll) is more peripheral than the heavily involved passing machine that Ribery has been in recent years. We don’t really know if his body can still hold up to a lot of minutes yet. Hopefully we get to see Ribery back in full flow and this decision will not be made by injury. Can they win the Champions League? Of course they can. They are right there with Barcelona when healthy; fans everywhere would win if we see the two face off, preferably in a semifinal, at full health. The first 17 games for Thomas Tuchel as the head man at Dortmund have pretty much been an unqualified success. Dortmund have returned to a comfortable 2nd place position behind powerful underlying numbers. Simply checking the goals from last year to this show the attack has improved in leaps and bounds, last year Dortmund scored just 47 goals all season while they have already reached that number at the break this year. Obviously, last year was an anomaly as far as bad luck goes but it’s not simple luck reversion, the underlying numbers are significantly improved on the attacking side. First, they simply have more of the ball in dangerous spots: their deep completion numbers have jumped up over 4 per game to come close to matching Bayern. The style is more conducive to generating goals than it was last season. The team has changed how they attack from the wild, at times ineffective, scramble of the final Klopp year to a more measured approach this season. They take many more shots from established possession, as shown by a Michael Caley article in October, and they play their way up the field using much shorter passes this season. This more measured approach has paid off big time around the goal. Last season Dortmund were essentially league average in completion % around goal while attempting those passes from league average locations, this year they are just barely behind Bayern at the top of those rankings. This attack looks much more like an elite side than last seasons. -short key passes (37, lead Müller by 1. Total key passes are led by cross/corner-heavy Pascal Groß from Ingolstadt). Along with his passing brilliance he has chipped in 6 goals and takes 3.2 shots per 90 with over half of those coming inside the box. Özil has been amazing and no one has the stat-line to match up with him this season, but if you were looking for someone who comes the closest it would be Mkhitaryan. His rise to Dortmund’s King man has seen Marco Reus fade a bit from the center of the board. Tuchel’s more controlled style plays more to Mkhi’s strengths than Klopp’s free-wheeling tactics which played toward Reus, though this trend began last year. While Mkhitaryan racks up the counting stats, Gundögan and Weigl have been the beating heart of the side. Those two finished the year 1st and 3rd in total passes played. Weigl has great passing numbers in his slightly more withdrawn role and is widely admired by all the tactical experts who watch the league but I can’t help wondering how much better he could be if he simply did 100 pushups a day. That’s my one free suggestion, Adam Lallana and Mahmoud Dahoud are free to take it as well. How are you supposed to win the ball with arms like this? When Dortmund have the ball, they aren’t far off Bayern and are certainly one of the best teams across Europe. Without the ball, there are still some of the same frailties we saw last season. You could see in the summary above Dortmund allow the 2nd-closest average shot in the league. This has helped opponents get a higher % of shots on target against Dortmund than any other team in the league at 46%. That has added up to 23 goals allowed already. Last year Dortmund suffered through a similar phenomenon where they generally stifled opponents but the rare successful attacks were of extremely high value. The fact this trend has continued with an improved goalie is worrying and is what is keeping them from seriously challenging Bayern and joining the very top of European clubs. Stats like these always bring up the debate of “How good is Mats Hummels really?” He puts together an amazing highlight reel and his passing quality can be excellent but in recent years he makes several head-scratching plays a month and can look a bit slow or unfocused from time to time. Constantin Eckner wrote a piece detailing the questions around Hummels performance that summed up the issue nicely. Dortmund dropped him for a short while, but then suffered one of their worst performances of the year against Wolfsburg and he soon returned to the lineup. Is he that much better than Sokratis and Bender? I don’t know. What I do know is if I had three wishes from the omnipotent Soccer Genie who would tell me exactly how valuable certain players were I’d ask for Hummels first of all. He’s a fascinating player and by all accounts a fascinating person. (The next two might be Neuer and Raffael). A worrying(?) sign that merits further investigation was uncovered by Samira Kumar’s great research on center back gaps on crosses against Bayern. Dortmund’s centerbacks had the widest gap between them, with a large gap between the RB and CB as well. This is just one game but it’s an interesting lead. With no Klopp, you might expect the press to have slacked off but that hasn’t happened. In fact, Dortmund’s press is forcing more incompletions far from goal than ever before. Tuchel said he wouldn’t change too much and it doesn’t look like the strong pressure has eased much at all. We can see significant positional differences from Mkhitaryan, Kagawa, and Gundögan this year as the midfield has been rejiggered. We see minor differences, mainly less aggression, from Hummels and Schmelzer. Will depth be a problem? Adrian Ramos hasn’t proven a quality backup up front, meaning key man Pierre-Emerick Aubameyang is rarely rested. Gonzalo Castro has emerged as the season progressed and is extremely versatile but after him, there isn’t too much depth in attack with Januzaj not trusted and Hoffman out to Gladbach. Outside of fullback, Dortmund really don’t have too much depth anywhere. And even there new signee Park has been quite unimpressive. Can they fix the defensive missteps that have led to 65 goals allowed over the past 51 games? This is the big step they need to make to build momentum for next years title challenge against Ancelotti’s Bayern. This year remains a dream but Dortmund have made big strides to get back very close to being an elite European club.